Year round vacation homes in Indian Creek, near Walt Disney World Florida. Taking a vacation in Orlando? Choose Indian Creek Orlando villa rentals for the perfect holiday home-from-home in the Formosa Gardens area of Kissimmee. You will be 5 minutes from Walt Disney World. Close to an impressive selection of shops, restaurants, theme parks and attractions, Formosa Gardens is a great base for side-trips. The villas are conveniently next door to each other – book them individually or rent them both for larger groups of up to 14 and make yours a holiday to remember. Fantastic villa, great location. We have had a great two week holiday. We have stayed in many different villas over the years, but this is clearly the “best” villa we have stayed in. the use of the computer was great and the pool & spa were exceptional. We will definitely return to the villa in the future and will be happy to recommend it to anyone. 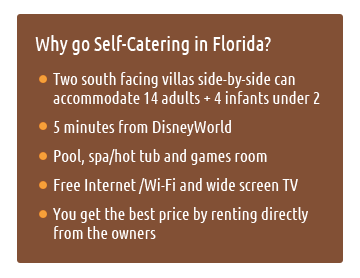 Just 5 minutes from DISNEY! The villa sleeps 8 adults + 2 infants. It has a private fully fenced south facing pool and spa. A wide screen TV and Free Internet/Wi-Fi keep you connected. Pillow top beds in all bedrooms for added luxury. Keep cool with air con throughout. The villa sleeps 6 adults + 2 infants. It has a private fully fenced south facing pool and hot tub. Wide screen TV and Free Internet/Wi-Fi keeps everyone entertained. Pillow top beds as standard. Air con throughout. A fast response to all web site enquiries. With many years of rental experience (ownership) under our belts we have an in-depth knowledge of the Orlando area and are happy to answer any questions you may have. We want you to have a great vacation! Genuine and authentic villa photos – we took them all. Pay your deposit to secure your booking. Contact Caroline or Nick today for availability and information. Indian Creek is a small community of executive and luxury homes situated South of Downtown Orlando and just 20 minutes drive from Orlando International airport off Highway 192. Cloud 9 and 7th Heaven Villas are conveniently located just 5 minutes from Walt Disney World and 20 minutes from Universal and only 1 mile from a choice of shops and restaurants including the Formosa Gardens Shopping Village. Contact Caroline or Nick today for further information and availability. With activities and entertainment for all the family, Walt Disney world is a must on your Orlando holiday. Visit Magic Kingdom and Disney’s Animal Kingdom or if a water park is on your list, how about Disney’s Typhoon Lagoon…and that’s just for starters! Memories are made for life at SeaWorld – with shows, exhibits and attractions that will amaze you. Get up close to the Manta Rays and Sharks or test your nerve on the mighty Kraken – a roller-coaster like no other! You can get your breath back whilst the kids enjoy Shamu’s Happy Harbor®. A terrific day awaits you at the legendary Kennedy Space Center. Watch a space rocket launch, lunch with an Astronaut, take a tour of Cape Canavaral or try the space Shuttle Launch Experience for a insight into the life of an astronaut.